On a wall in their living room, Christin Mullen and Christina Coleman have created a snapshot of their partnership out of dozens of framed photos—Chris and his line brothers at an Alpha Phi Alpha event in one; Christina with her siblings during a trip to Jamaica in another; photos of the two hugging after running the Brooklyn Half Marathon and another (their first family photo with puppy Huey) on the steps of the rust-colored Bed-Stuy brownstone where they live. It’s a mosaic, really, one constructed from Chris and Christina’s individual memories and moments from their life together. 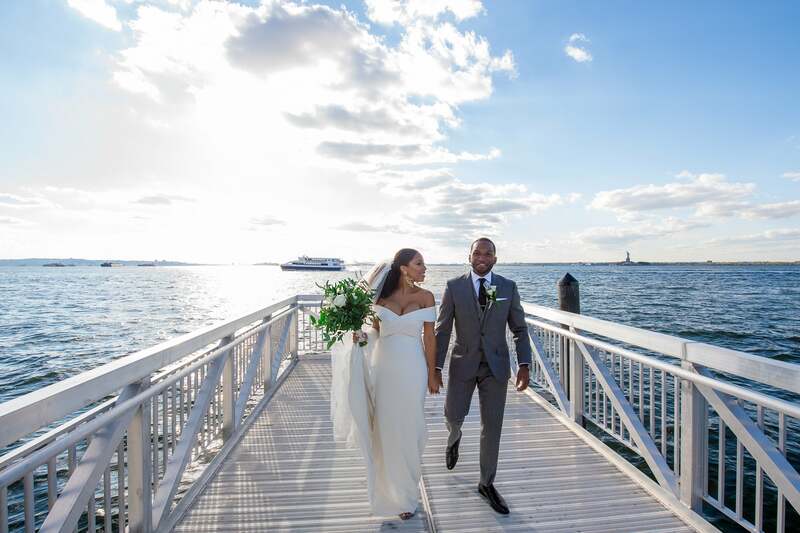 The two HBCU graduates (their household is one of many loving but intense Hampton and Howard battles) became Mr. and Mrs. Mullen this fall in a wedding that, even more than the mosaic in their apartment, represents the shared life they have forged. 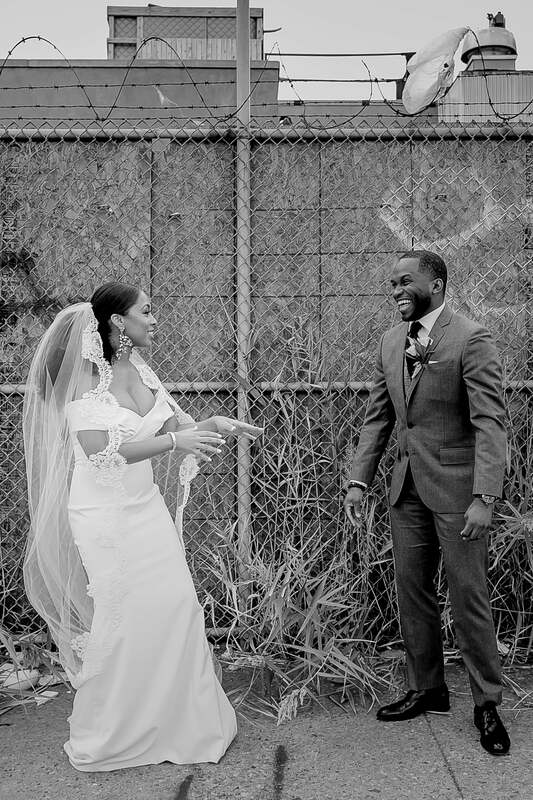 The reception featured a nod to old Brooklyn speakeasy whiskey bars at Chris’ request and classic African American literature in the ceremony—a distinctly “Christina” idea. 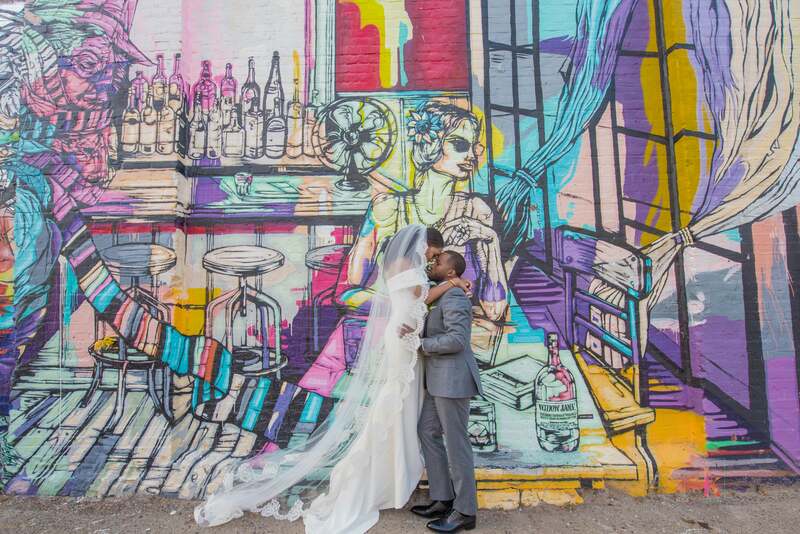 They agreed easily on Brooklyn as the location for their wedding. It is, after all, the place where the unlikely pair became a perfect match, where they’ve built their lives and where Chris proposed (at the MoCADA Museum). 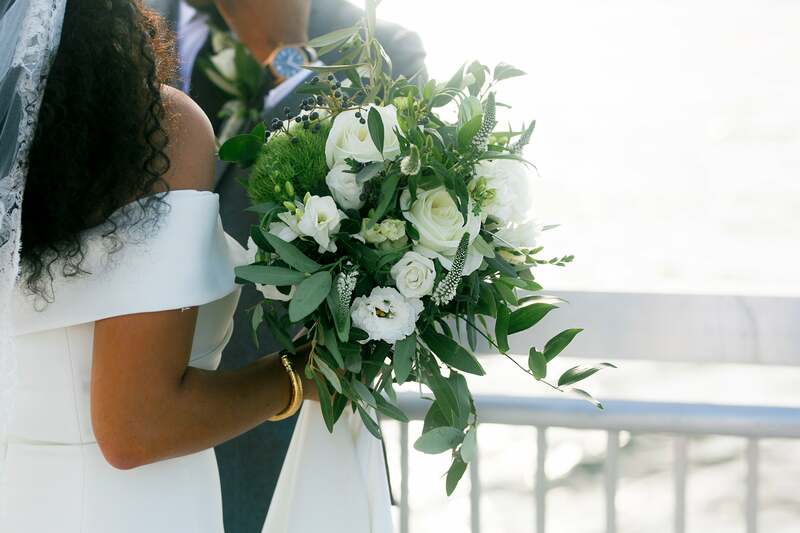 But it is their differences that make this couple special — far beyond their HU discussions, Christina’s spirit of spontaneity balances Chris’ analytical thinking — and a commitment to choosing each other, every day. 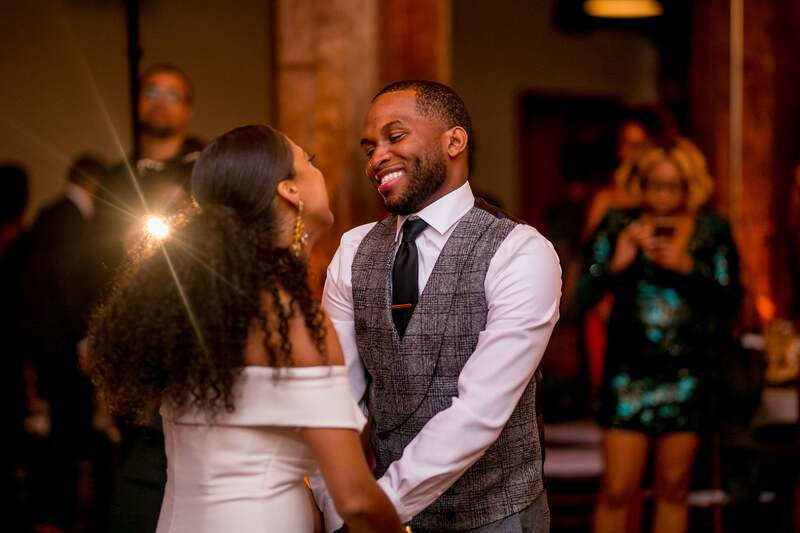 Both HBCU grads, Christin and Christina — repping Hampton and Howard University respectively — were often in the same places, parties and events at the same time throughout the years. But it wasn't until a fateful night at the Brooklyn Museum, when Christina was visiting from DC, that the two finally met in person. "We met at First Saturdays," Christin said, referencing the popular Brooklyn event. "Christina and I had mutual friends who were meeting at the museum, and we locked eyes." But the encounter was brief. "The exchange was all of two to three minutes," Christina said. "No one in the crew of guys spoke to us when they approached. But when they walked away, one guy turned around and said, 'have a great evening.'" It was Chris, and Christina happened to mention to a friend that the gentleman was attractive. "Moments later, I get a text message. 'Hey, this is Christin.' By this time, I’ve already forgotten the boy with the girl name. So I say to no one in particular, 'who is Christin?' My friend laughs and tells me she gave him my number. Classic Brittany." But it only took one message. In the six years since that night, the two haven't gone a day without talking to each other. 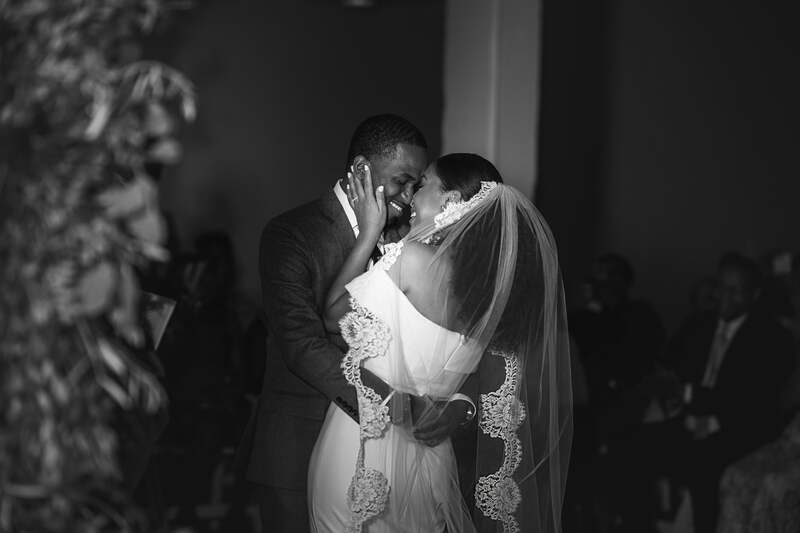 "When I proposed, I wanted to ensure I incorporated our journey as a couple. 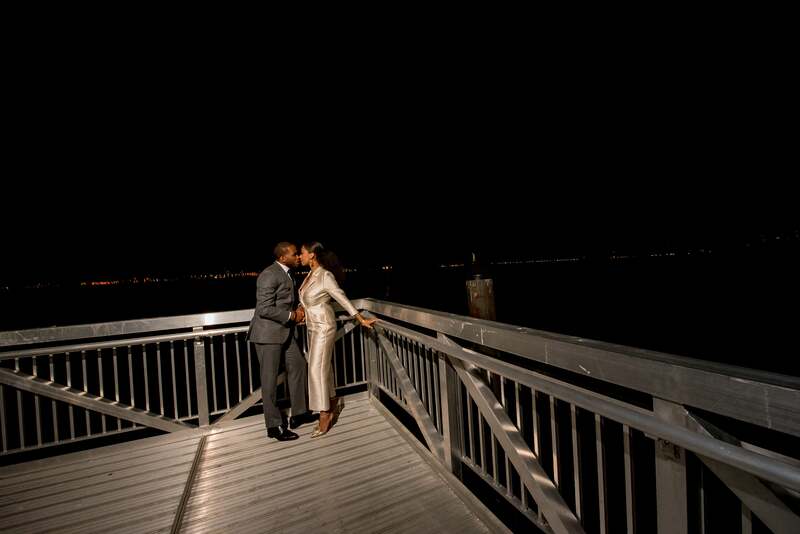 Since we met at a museum, my idea was to create a gallery/exhibit of our love," Chris said. 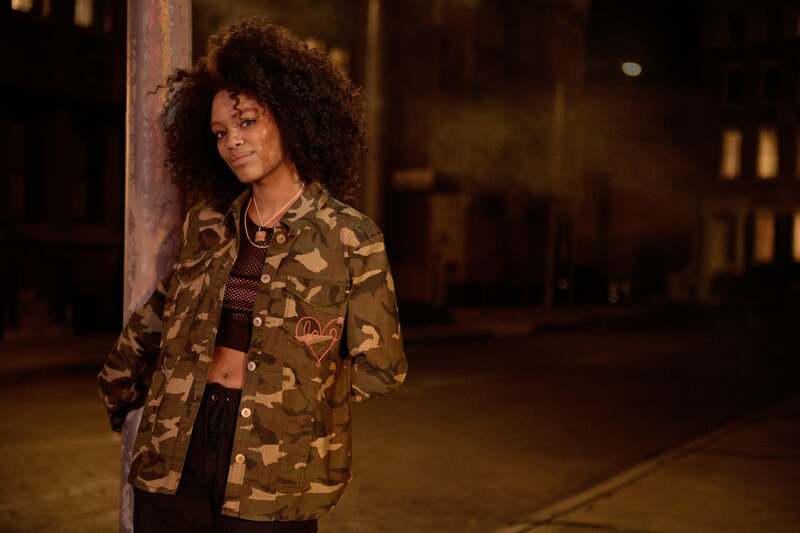 "I rented space at MoCADA, The Museum of Contemporary African Diasporan Arts, in Clinton Hill, Brooklyn. With the help of my line brother, I took a bunch of pictures from our relationship and blew them up to full size. I put them all around the museum walls. When she walked in — she thought she was just visiting the museum with friends — she was able to see the progression of our relationship on those walls. She was shocked. Completely shocked." "I knew Christina was the one from when we met," Chris said. "I always knew there was something different about her. As we matured through our relationship, it became more evident that we were meant to be together." "Chris is determined to make the world a better place for me," Christina said about why she wanted to marry her husband. "He’s determined to make sure I have the best memories, that I have the greatest experience as a living, breathing human on this earth. No one has ever cared that much. He has given me something to look forward to every day, he makes me want to be a better person. And we’re a damn good team." 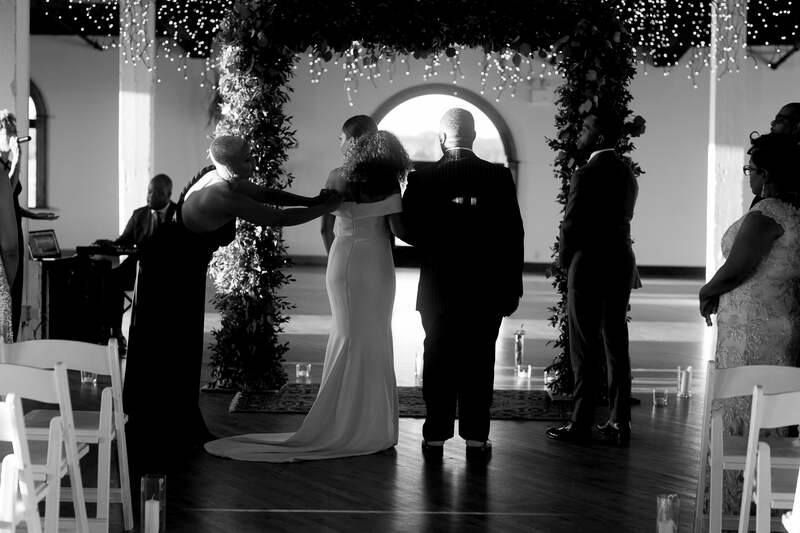 "I wanted to marry Christina because of her heart and strength," Chris said. "Her heart is huge, and her love is endless. Her strength has carried her through a lot of situations in life average people would not be able to make it through. I want to marry her because I know her strength, I know what she can do, and I want to be that person who is by her side as we conquer the world." 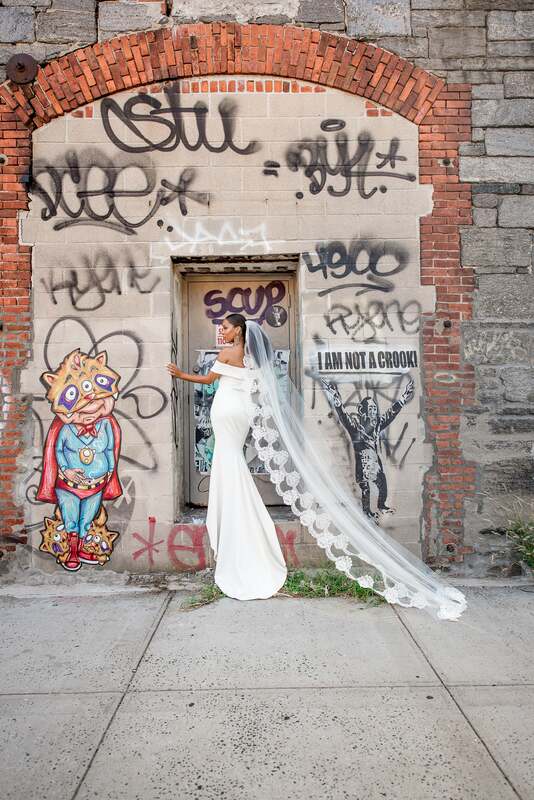 "Planning this wedding made me face a lot of truths about my life," Christina said. "It was a hard road reconciling with family and friends, forgiving people and letting go. And I didn't know this would bring all of that up. But Chris was there by my side the whole time. I found God. And therapy. And I found something else I didn't even know was possible — another reason to love my husband." "Before we got married, I tried to imagine life without her and I couldn’t. That’s why I married her." 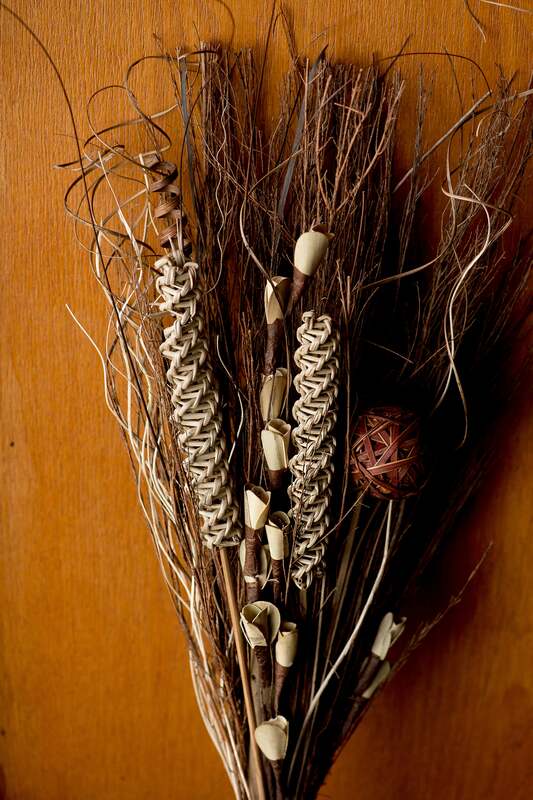 "My mother made this broom for us," Christina said. 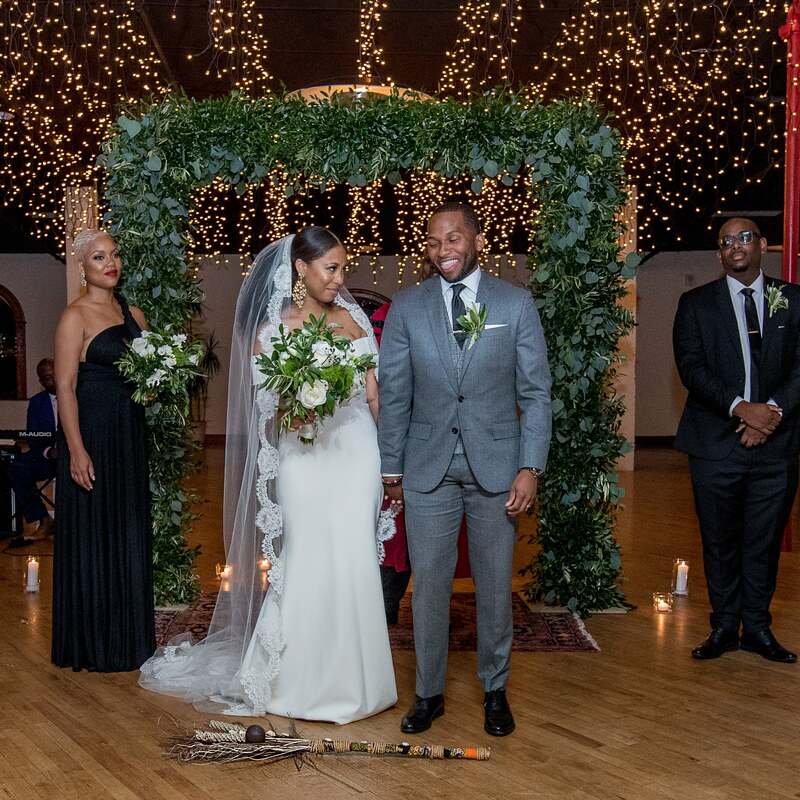 "It was important that we incorporated African American history in our ceremony, and jumping the broom was a non-negotiable. I hope I can pass this beautifully made piece to my daughter or son when they get married." "I wanted to wear jewelry that reminded me of the gold, bold styles of African women on the continent," Christina said. 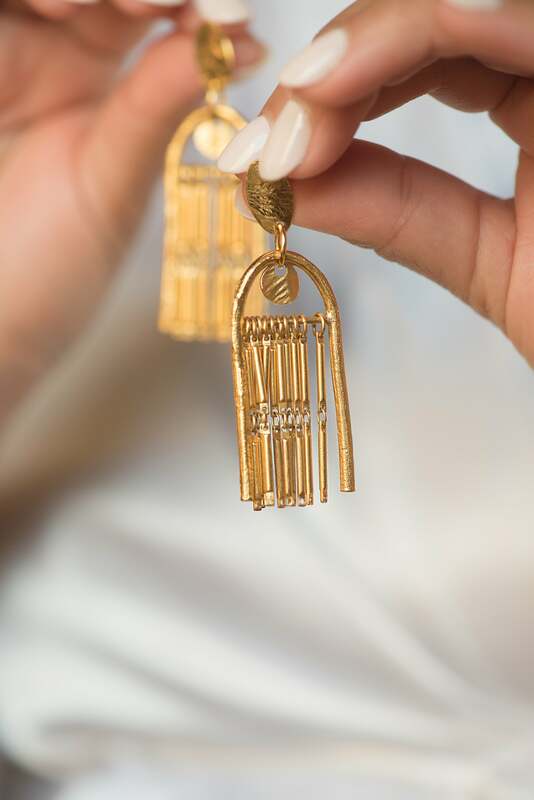 "I wasn't sure how it would look with my dress, but Lingua Nigra's Fringe Theory earrings were the perfect fit, especially for my second outfit — a pearly white tuxedo jumpsuit." 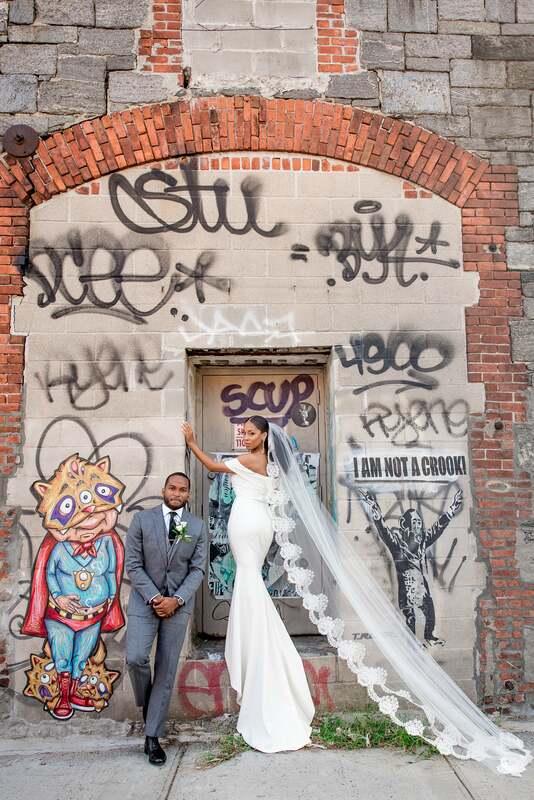 "I had one rule for this wedding when it came to a suit," Chris said. "Two words — custom-made." 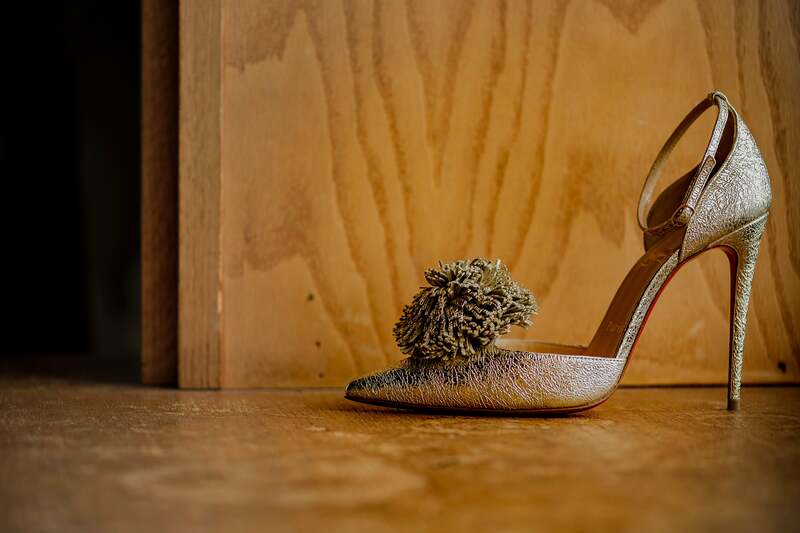 The search for a perfect shoe took longer than finding the BHLDN dress the bride wore on her big day. But when she stumbled upon these pom pumps by Christian Louboutin, she knew that search was over. Christina had two pieces of criteria for her wedding dress — could she dance in it and could she sit down. 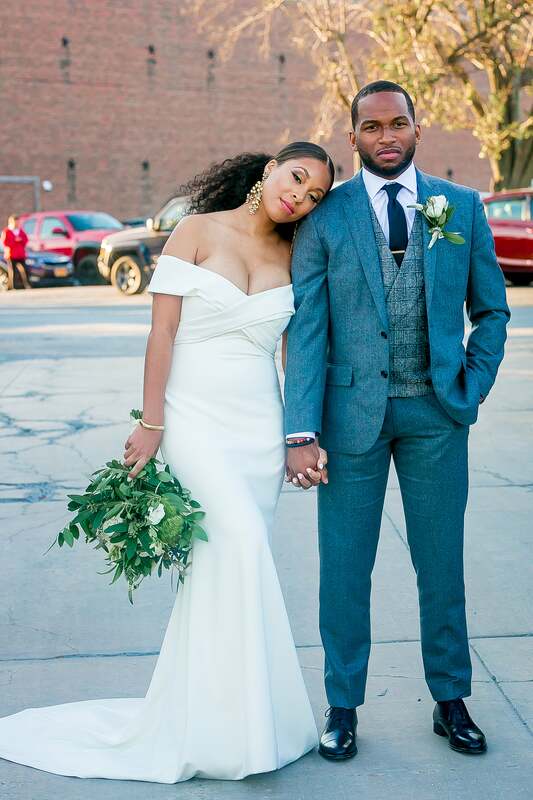 This Blake gown from BHLDN fit the bill, and made the bride feel like a classic queen. 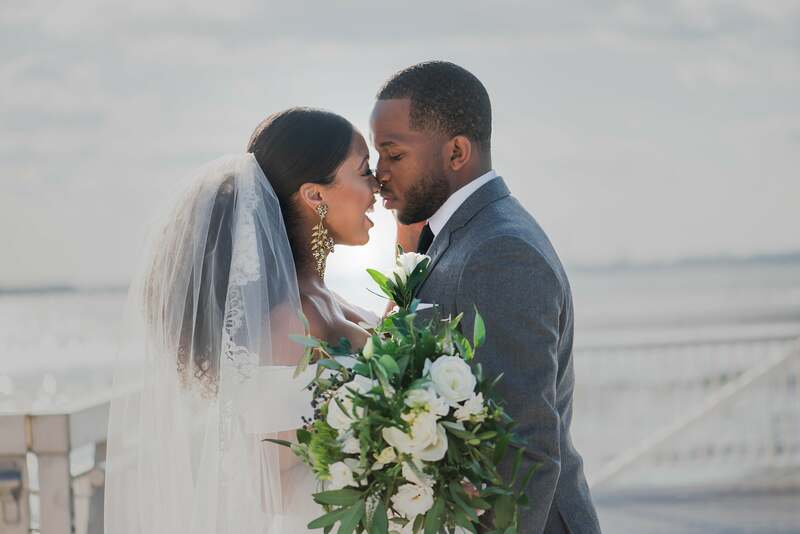 "I met Pierre at ESSENCE Festival, where she did my makeup for the first time," the bride said. "And I knew I needed her for the wedding. Now, I won't let anyone else touch my face." 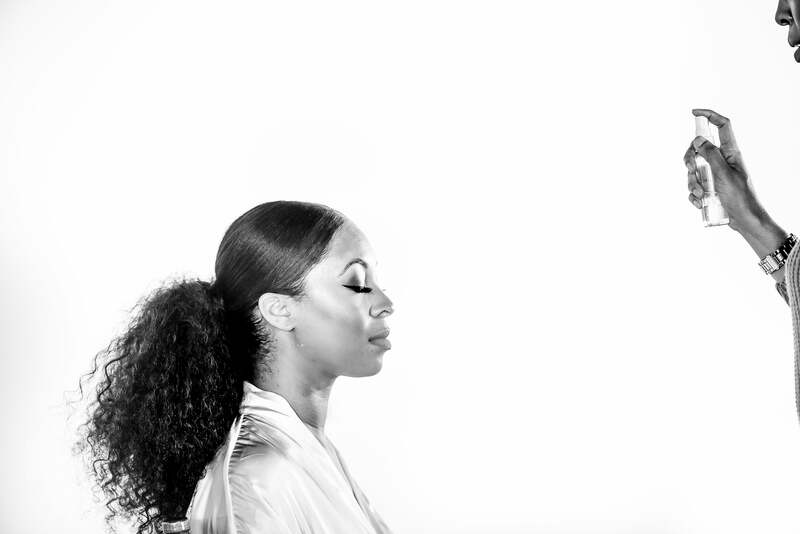 "Tina continues to amaze me with her drive and sense of purpose. She is in constant motion in every aspect of her life, and I love that about her." "I trust him. It's that simple. I trust that he will always act in my best interest and will do whatever it takes to protect my heart." What was the first thing Christina noticed about Chris? "His only dimple, left cheek." But it was his care and consideration that made her fall in love. 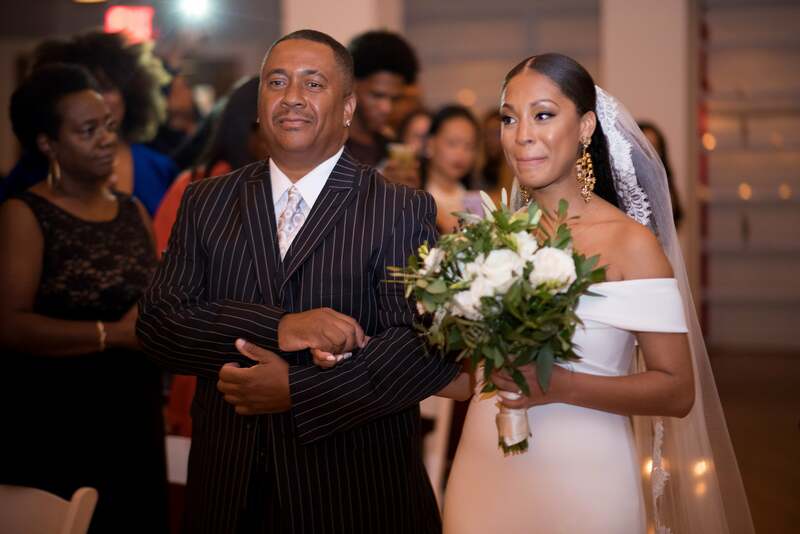 The bride walked down the aisle to one of she and dad's favorite songs, Jimi Hendrix's 'Little Wing,' sung live by one of the bride's best friends. The bride's mother, Dorina, beams with joy during the ceremony. Christina and Christin chose to write their own unique vows for the ceremony. 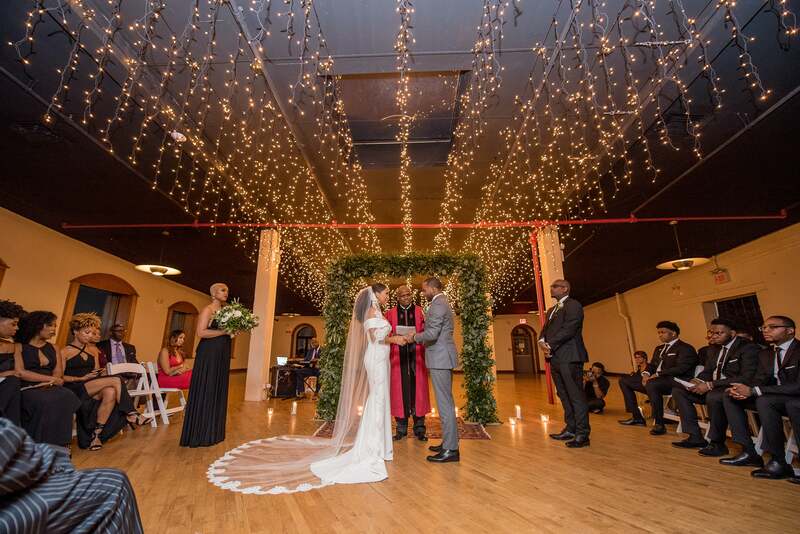 "I included a line from Toni Morrison's 'Song of Solomon' in my vows," Christina said. "I'm a writer and he's an educator and it just made sense to pull in one of my favorite quotes from my favorite authors." Chris went the opposite direction, landing a joke in the middle of his vows that had guests howling with laughter. 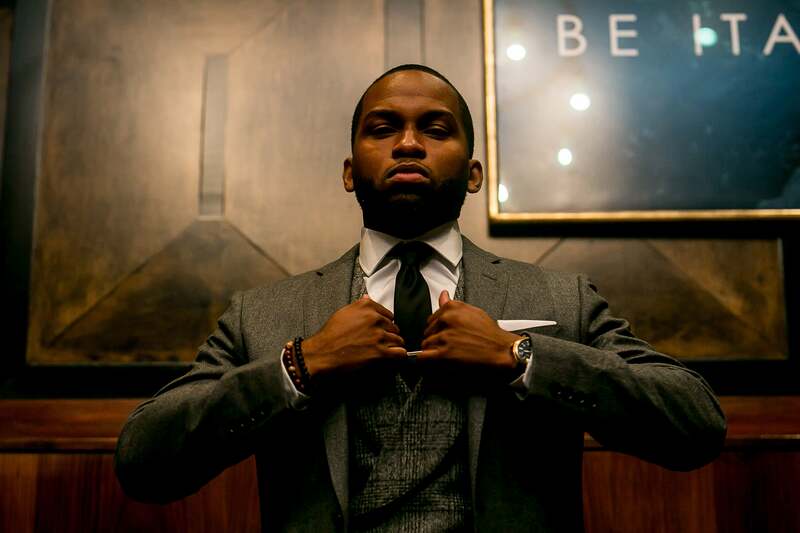 "I said we would send our kids to the most prestigious HBCU...Hampton," Chris said. Needless to say, the bride wasn't laughing along. 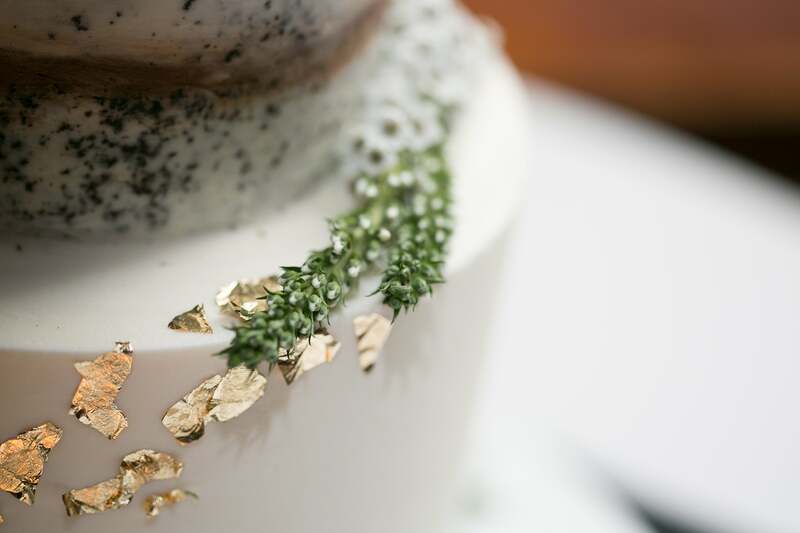 Florals weren't important to the couple, who chose to decorate their rustic event space with greenery of every kind. 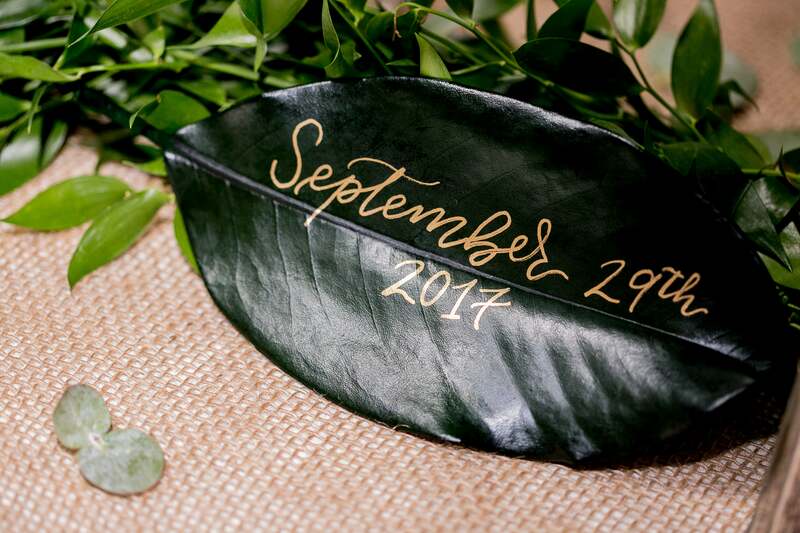 From magnolia leaves to eucalyptus, every inch of the Liberty Warehouse — with its wooden beams and exposed brick — was laced with beautiful plants in place of flowers. 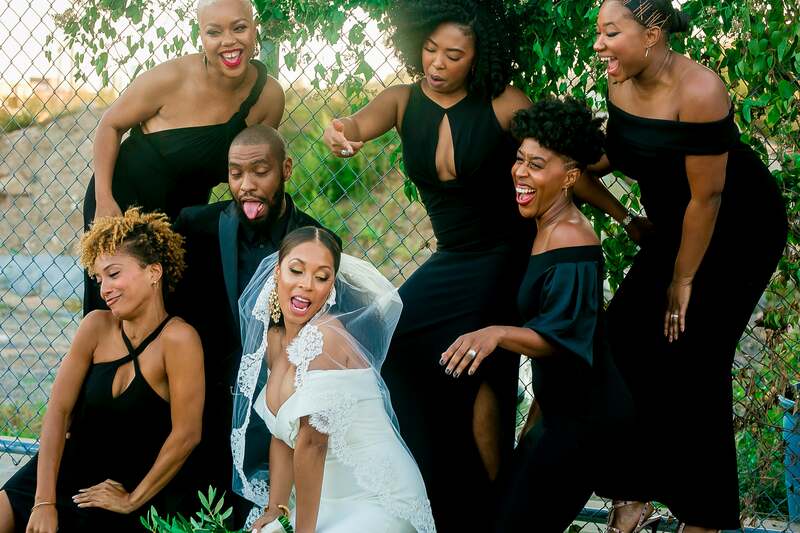 To keep the energy on the union ahead, the couple chose not to include traditional bridesmaids and groomsmen, instead opting to have their "special people" dress in all black. 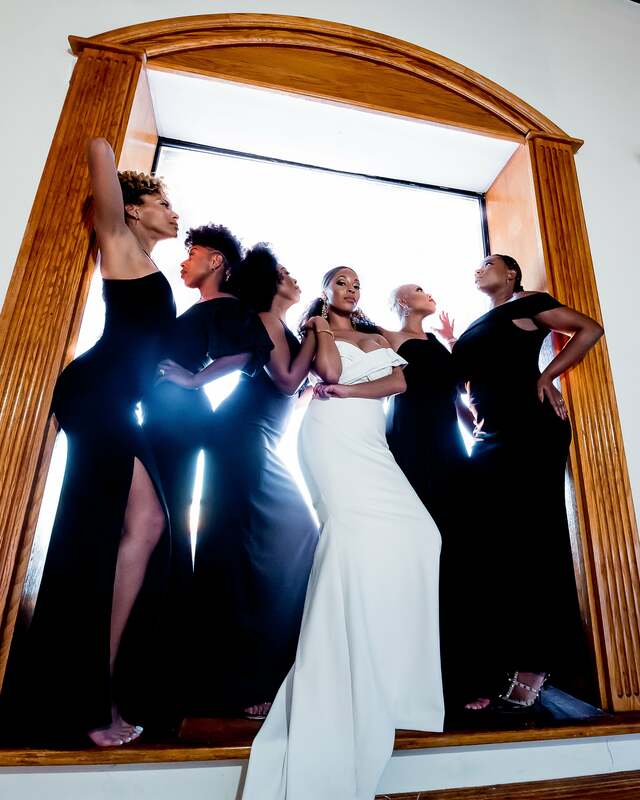 At the ceremony, each of the women pictured here stood up and recited a line about love from famous Black literature. "These women, the most important women in my life, and my best man Robert kept the mood light and fun throughout the day. And the song of the day was definitely Cardi B's 'Bodak Yellow.' As you can clearly tell from this photo." "My sister is my best friend and my rock, and I couldn't imagine this day without her by my side," Christina said. 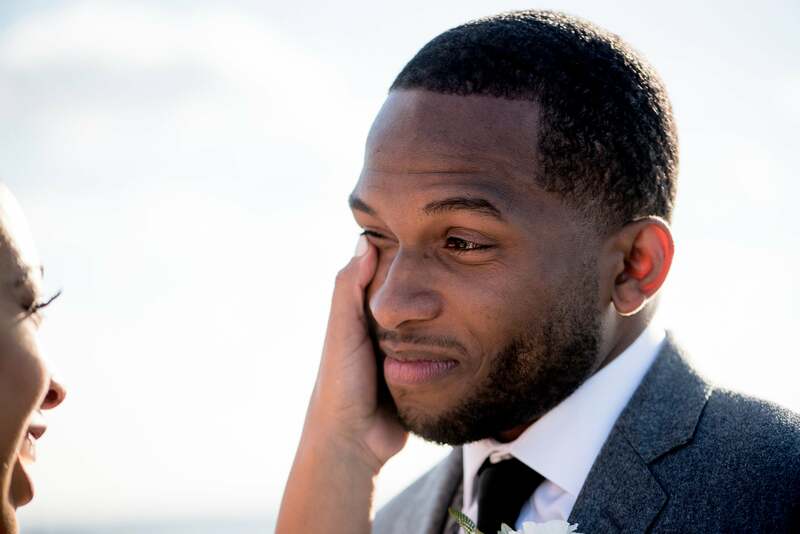 "She was the only person I wanted standing next to me when I married the love of my life." Here is the bride's sister, Autumn, fixing her dress during a brief pre-ceremony rehearsal. 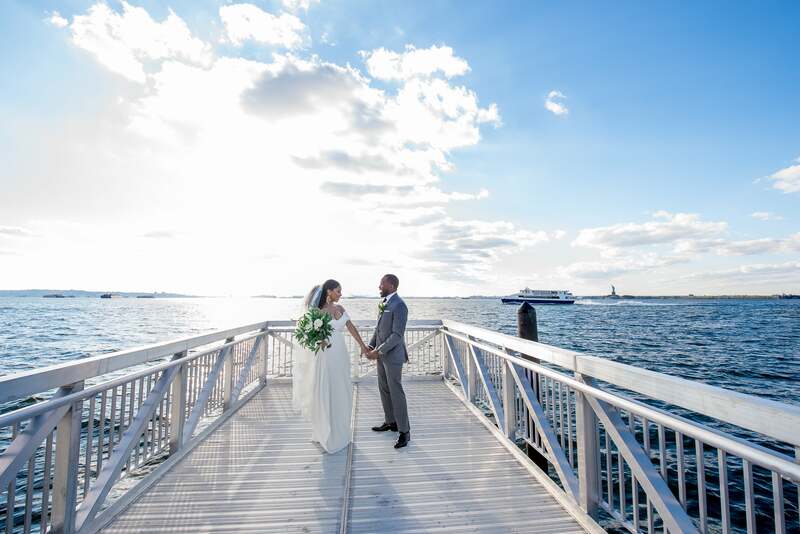 The Mullens were introduced as Mr. and Mrs. to the tune of JAY-Z and Kanye's 'Gotta Have It.' 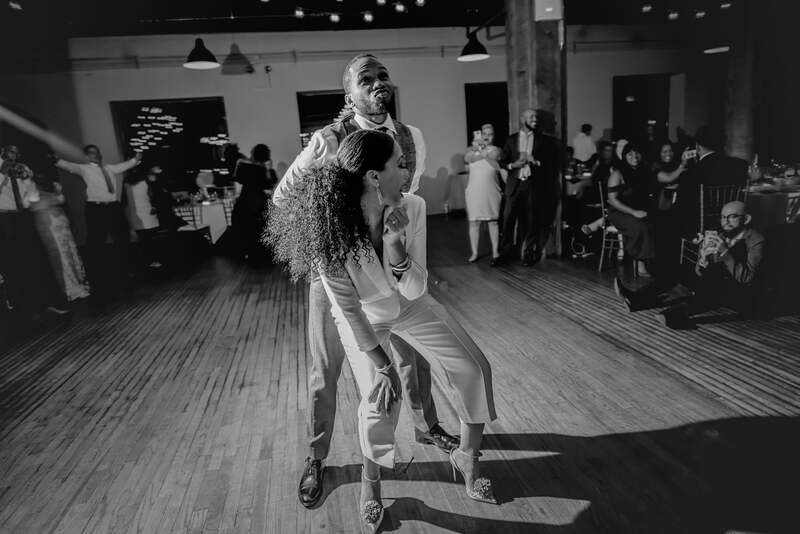 It was fitting — on one of their first dates, Chris and Christina realized they both shared a love for rap music, and often battle one another. 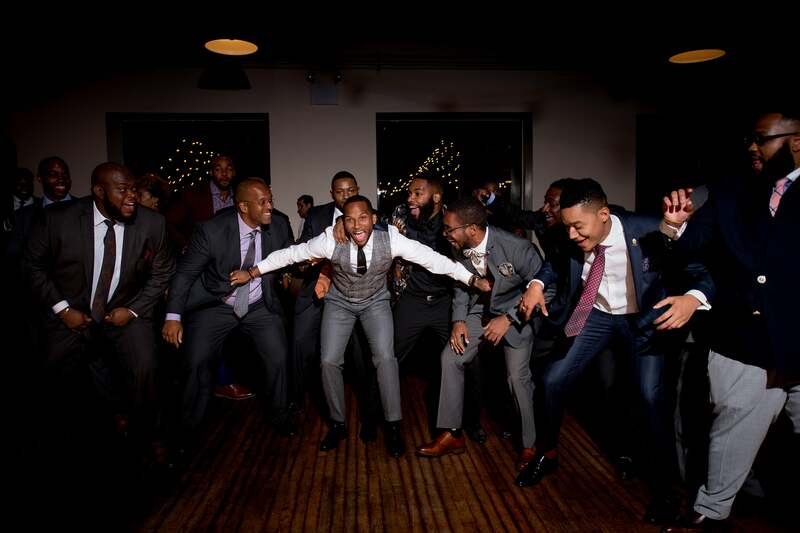 They brought that same spirit to the wedding, reciting the 'Watch The Throne' lyrics back and forth while their guests surrounded them. 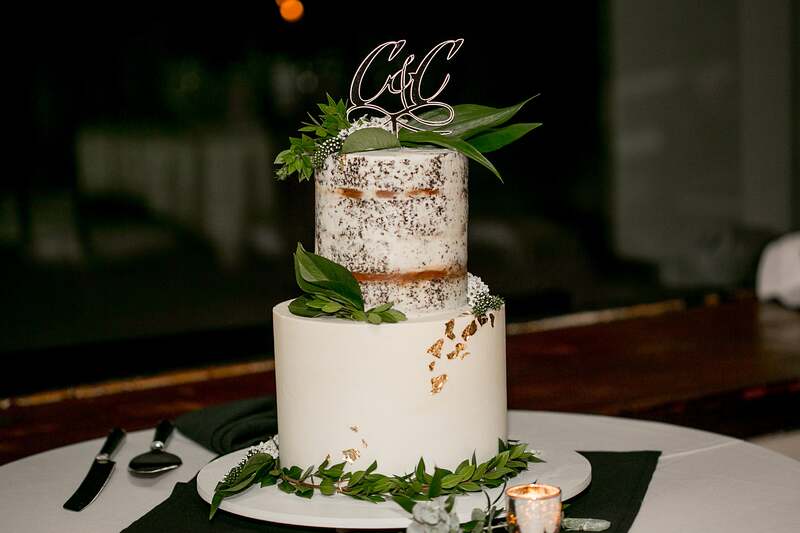 BCakeNY created a minimalist, but unique cake for the couple that included a lightly frosted chocolate tier and a custom gold topper that represented the newlyweds shared name — Chris. Flanked by the bride's father, his brothers and best friends, the groom stands surrounded by support and love on his big day. 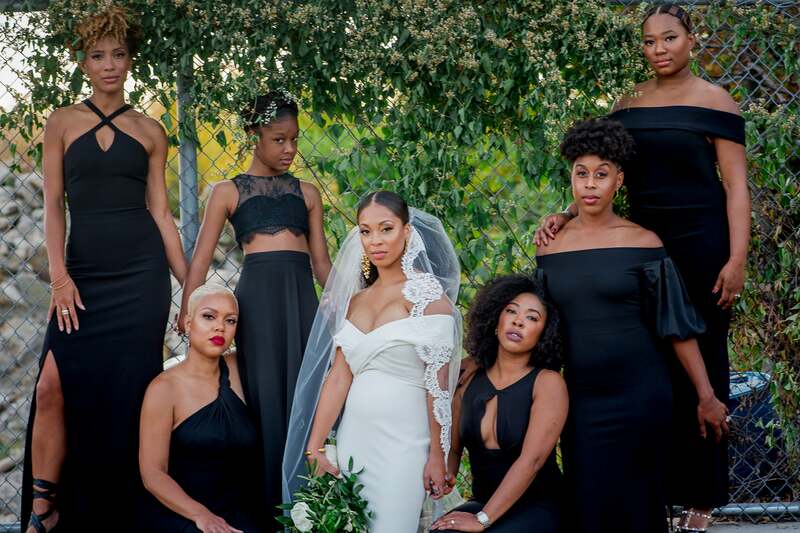 There was some serious Black girl magic at this wedding! "She’s taught me to never settle and to take risks, something I wasn’t accustomed to before. She is the challenge of my life, and I love it." 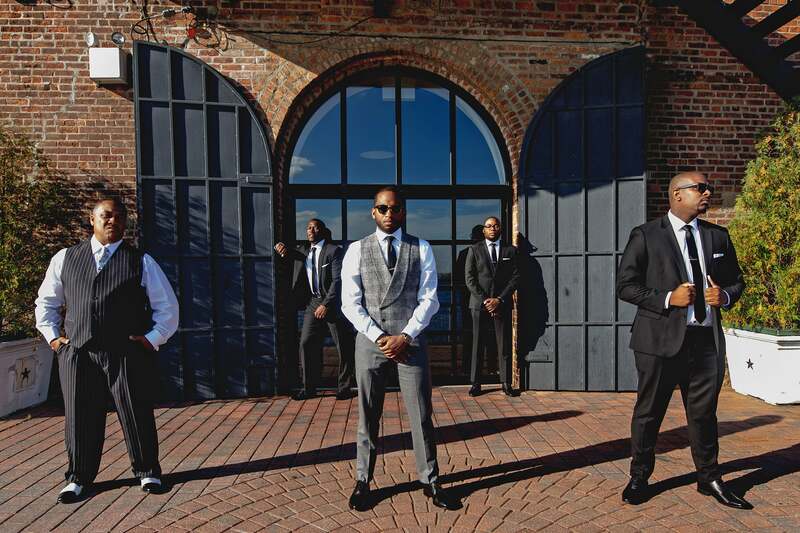 The brothers of Alphi Phi Alpha prepare to 'ante up' after they serenaded the bride with a song of unwavering support for the new union. 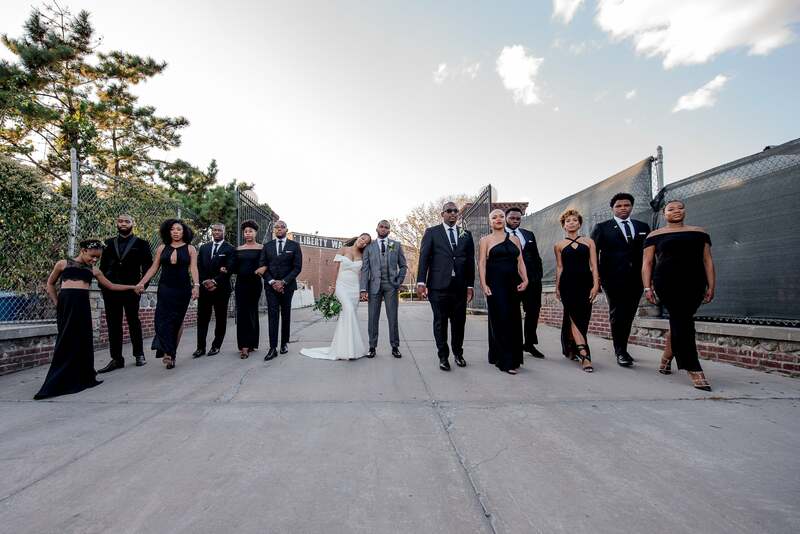 Not only were the black dresses and suits a classic choice that fit well with the wedding theme, Chris and Christina also wanted to make sure that the threads were a nod to Black love. 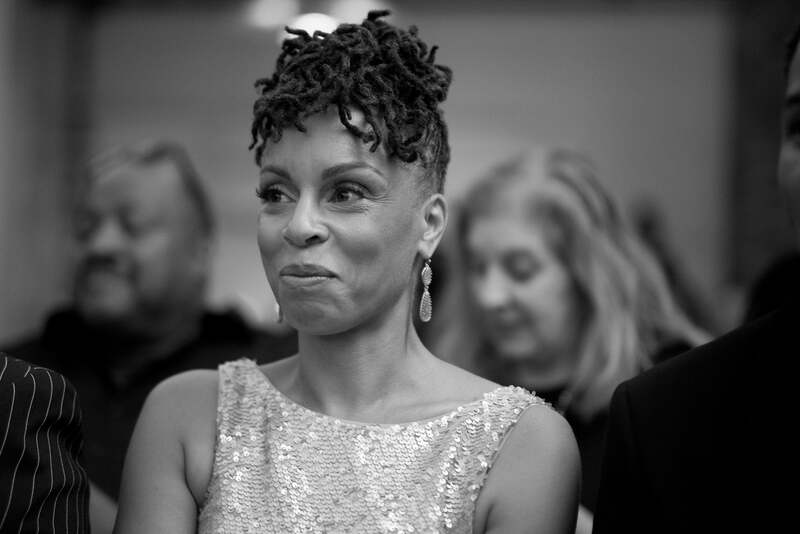 "The revolutionary spirit of Black love was present at our wedding," Christina said. "We wouldn't have it any other way." 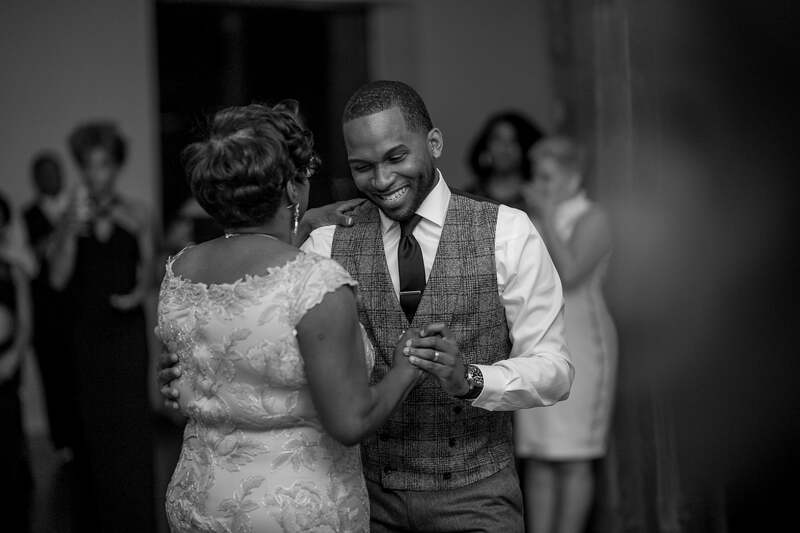 Chris dances with his mother, Deborah, during the ceremony. 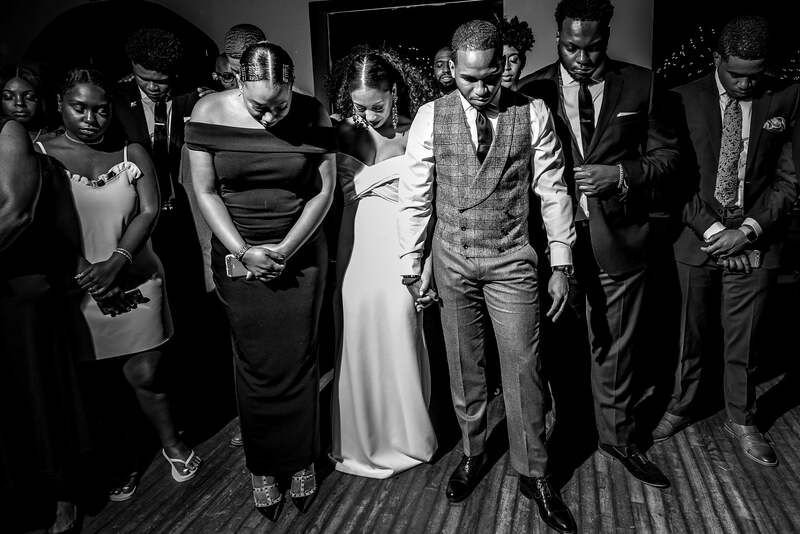 Photographer Kesha Lambert catches an intimate moment of prayer with the wedding party. 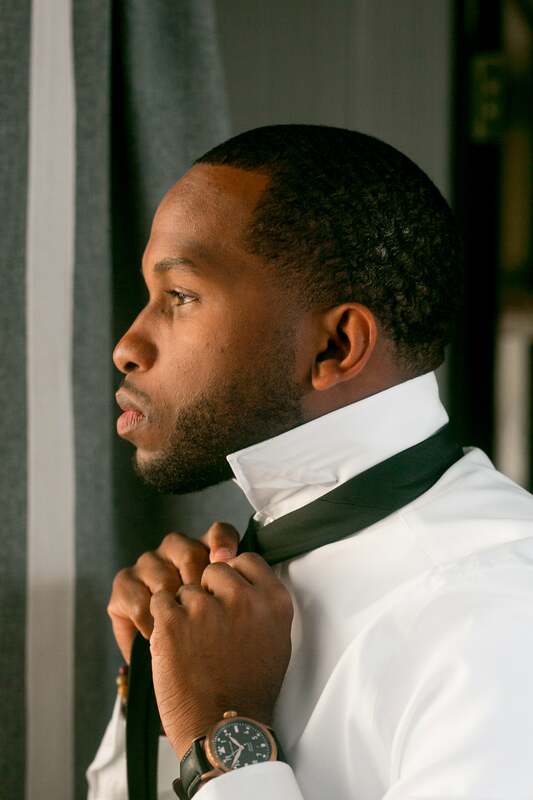 The bride initially wanted to wear a suit to the ceremony. 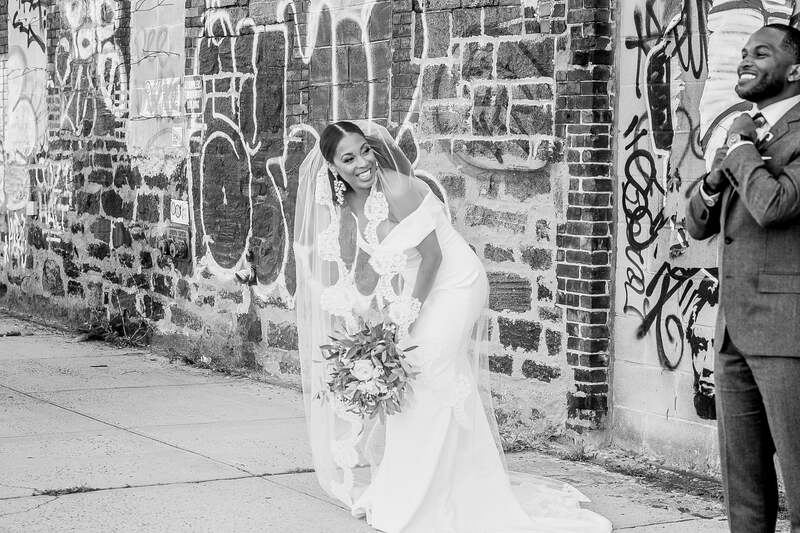 But after she found the gorgeous gown, she decided to wear an ASOS tuxedo jumpsuit — found online by a friend and former fashion editor — that she purchased for just $100 and tailored just so to fit her frame. "It was the bargain of the wedding," the bride said. "And the best decision I've ever made." Now you know it's a party with these two HBCU grads! 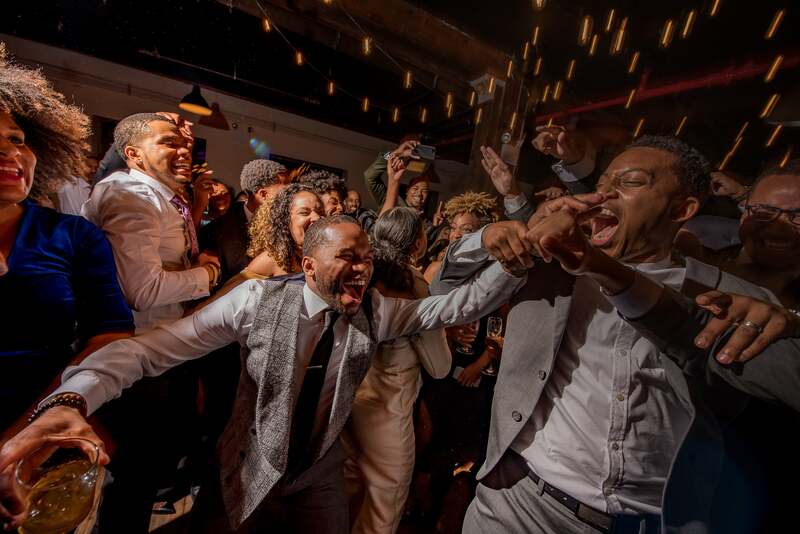 With the help of DJ Premonition, the couple and their loved ones were able to partake in one of Black culture's most treasured pastimes — The Swag Surf. 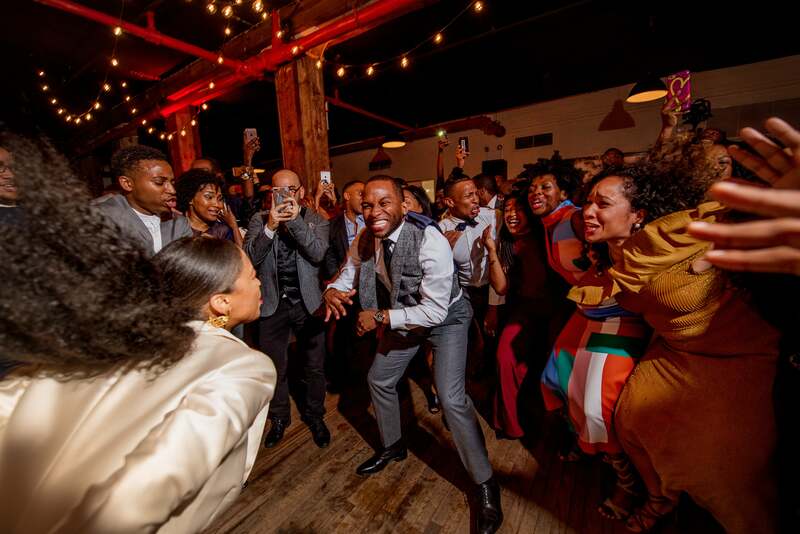 The wedding wasn't complete without a dance battle from the two schools, where the bride and groom both donned hats from their respective HBCUs. 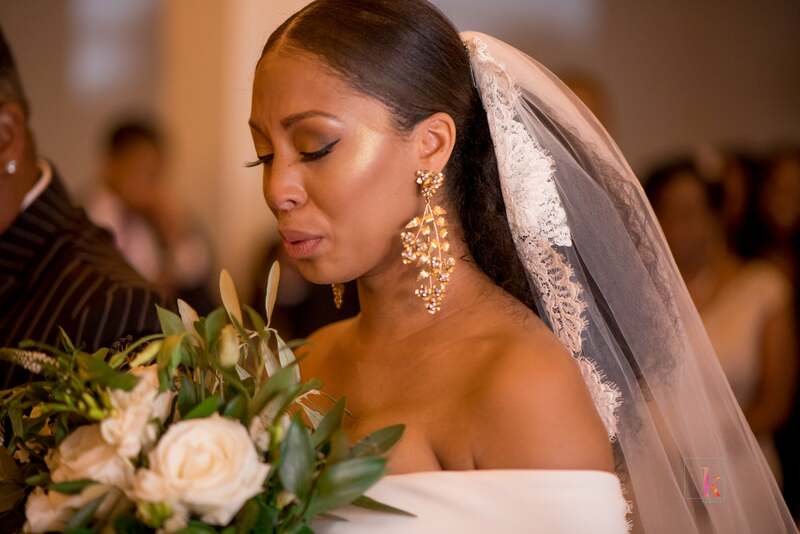 "Howard won, of course," the bride said. But the groom begs to differ. 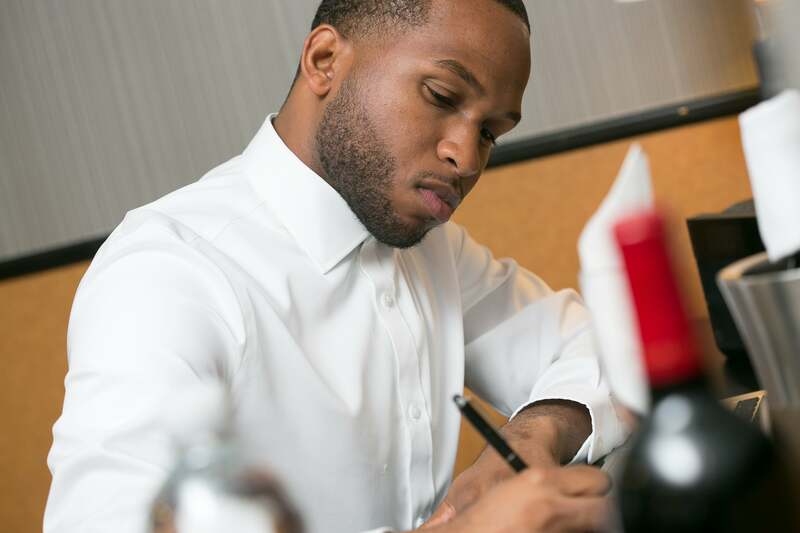 Favors were provided by Black-owned, Brooklyn-based company, LIT Brooklyn, who provided personalized candles in three signature scents. 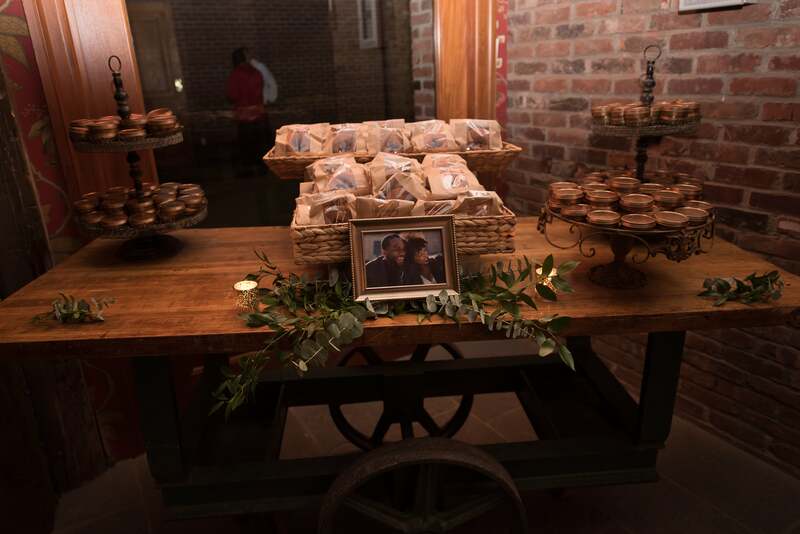 Apple cider donuts and warm apple cider were also given to guests as they exited the party. "I’m a whirlwind. Chris grounds me. He gives me something to hold on to. And reminds me of what’s important in this world. He is literally my home in this world."